I wasn't able to post the featured blog last November, but I'm not gonna skip on that, especially with the fact that I'm featuring GLENTOT of WICKEDMOUTH.COM ! CONGRATULATIONS GLENTOT! =p NOVEMBER BOY! 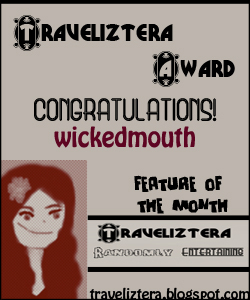 Yes, I know... New layout calls for a new award design too. I was actually thinking of changing the whole layout last June, but I've been... lazy. LOL. I remember asking GLEN if my blog's pink color actually bothers him since I was thinking of a more formal theme. Good thing his opinion was the same as mine, making me pursue the plan of changing my blog's theme. I also realized that my last layout was kinda JEJEMON-ish. LOL. So, I'm sorry to my past awardees for the JEJEMON-ish awards. I'll be glad to change them for you. Haha! To be honest? I was really scared of him when I first stumbled upon his blog. Despite the sense of humor, I noticed how he'd comment on my posts--very ... suplado. HAHA! Just kidding Glen. Of course, I know you're having a hard time giving me weird comments, since my blog's more on the informative side. I'm actually a reader of his blog and MIND YOU GLEN, I DON'T SKIP READ. Muhahahaha! Thank you for accepting the challenge of reading and replying to my last MAJOR post in a MAJOR MAJOR way =p. I've seen this dude two times. The last time I saw him, he was like a mushroom. He suddenly popped out at the least expected place. Hahaha! While lining up at a cafe, I suddenly saw a guy smirking across me. Hahahaha! GLENTOT, kabute (mushroom)! He's a really funny blogger. He posts serious stuff once in awhile, but you couldn't help but think if you should be replying seriously or sarcastically because of his blog's nature. Haha! And traveliztera has a facebook page too. Search: "traveliztera". LOL. Kon-gratz-su-ley-shun kay Glentot, pacanton ka naman! Ni-like ko na rin pala page mo traveliztera, LOLOLOLOLOL. Naks.. Congrats Andoy. Haha. Ikaw na talaga Idol. I'm a fan na telega! Arte? Haha. Umiistructure naman kasi si Idol, nakakabilib. Funny pa. Payn! Congratulations Glentot. Ang taas taas mo na, pero kaya ka pa din naman maabot. Nyahahahaha. natawa ako. parang mushroom haha. Ingat (first time ko dito)!! ha! I've been "away" for too long, and there's a lot of bloggerwood happenings already. Whoever he is, you have made him sound all interesting already! Hahah..
Dahil hall of famer na ako sa Traveliztera Blog dapat ayusin ko na ang blog posts ko hindi na ako magmumura and magpopost ng bastos. Joke haha. Salamat din po sa mga nagcomment at nagcongratulate na mostly eh mga ka-bloghop rin, thanks mwahchupa!!! yihee!Kilig si ANDOY...chos.Well deserved si Andoy...Ang kabuteng mabait pero malupet.hahahaha!!! yown oh! congrtas kay Glentot! Reader din ako ni Glentot and nakakatuwa ang kanyang sense of humor.